But it isn’t for me. A $25 for a wine tasting seems a bit high, especially when you are in Healdsburg and most wineries around you charge five dollars or offer a complementary sample flight. Lambert Bridge Winery is on the west side of Healdsburg just north of Sonoma. It’s a region we explored recently, finding some wonderful wines and some not so wonderful wines. This winery had two flight options, a standard flight for $15, and the reserve flight for $25. 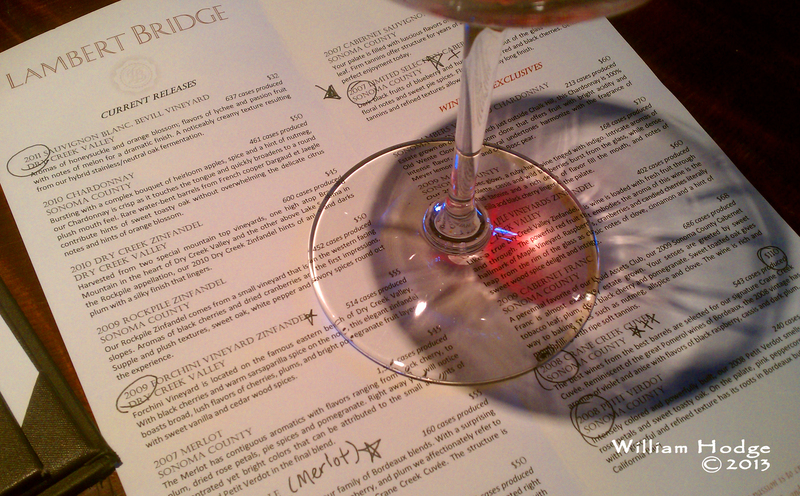 The wines on the reserve flight price points range from $45, a Merlot, to $110, a cuvée. So what does do $100 bottles of wine from Healdsburg taste like? We wanted to find out so we ventured $25 to sample what these folks create. We were not impressed. While the wine was good, it just didn’t sing for us. And since the dollar still means something to us, a wine costing $100 has to sing opera, rock ‘n roll and bluegrass all at once to catch my attention. And these wines just didn’t do it. If you compare prices to the number of cases produced, you’ll see some inverted numbers. I’m used to seeing higher prices with limited production. Yet here we have a $95 bottle of wine with 751 cases produced. As well you can see a $110 bottle of wine with 534 cases produced. Exclusivity normally commands a higher price point. When your baseline is a wine like Denner or Justin, with high price points in the $50 range, it’s difficult to pull $100 out of your pocket for wine that does not match up. You tell me. Is $25 a reasonable price for a sample flight of reserve wines? What do you want from a $100 bottle of wine? This entry was posted in Cabernet Sauvignon, Healdsburg, Merlot, Russian River Valley, Sonoma, Tasting Room Etiquite, The Pleasures of Tasting Wine, Thoughts About Wine - Exploding Ruby Flowers On Your Palette, Zinfandel and tagged bridge, cabernet, healdsberg, lambert, petit, Sauvignon, tasting, wine, wineries, zinfandel.